A wigmakers' guild was established in France in 1665, a development soon copied elsewhere in Europe. 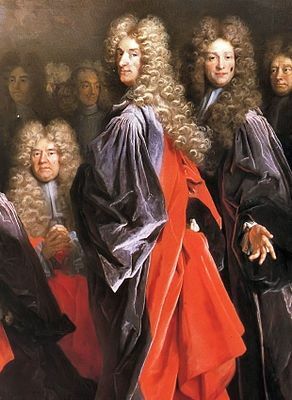 Their job was a skilled one as 17th century wigs were extraordinarily elaborate, covering the back and shoulders and flowing down the chest; they were also extremely heavy and often uncomfortable to wear. Such wigs were expensive to produce. The best examples were made from natural human hair. The hair of horses and goats was often used as a cheaper alternative.